Guest Post: Bringing the Heat with Rhino Feet! | What's In John's Freezer? Guest Post: Bringing the Heat with Rhino Feet! Almost a year ago to the day, I submitted my first paper written with John Hutchinson and Renate Weller at the RVC and it has (finally!) just been published. To celebrate, I have been allowed to temporarily hijack ‘What’s in John’s Freezer?’ for my first foray into the world of blogging. I started the paper back as an undergraduate veterinary student. It was my first experience of proper research, and so enjoyable that I’m now doing a PhD, studying sesamoid bones like the patella! 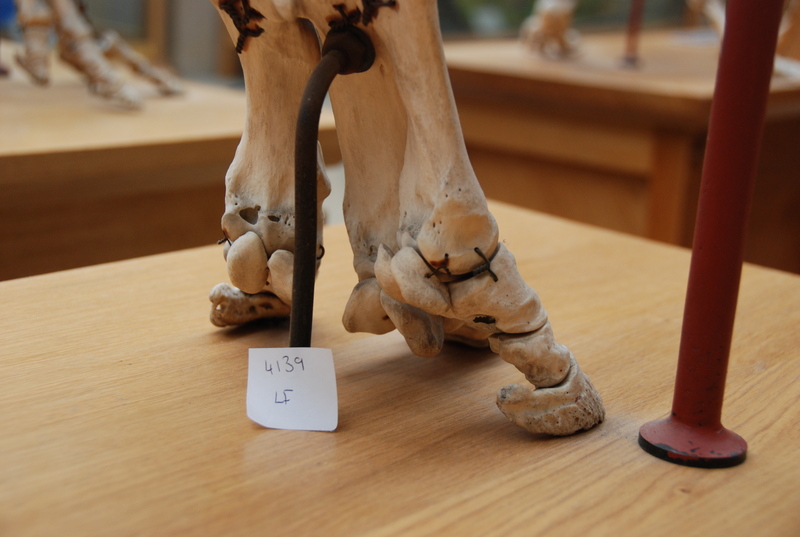 We wanted to discover more about the types of bony disease rhinos get in their feet, of which there isn’t much known. Rhinos, of course, are big, potentially dangerous animals – difficult enough to examine and doubly difficult to x-ray clearly because of their thick skin. 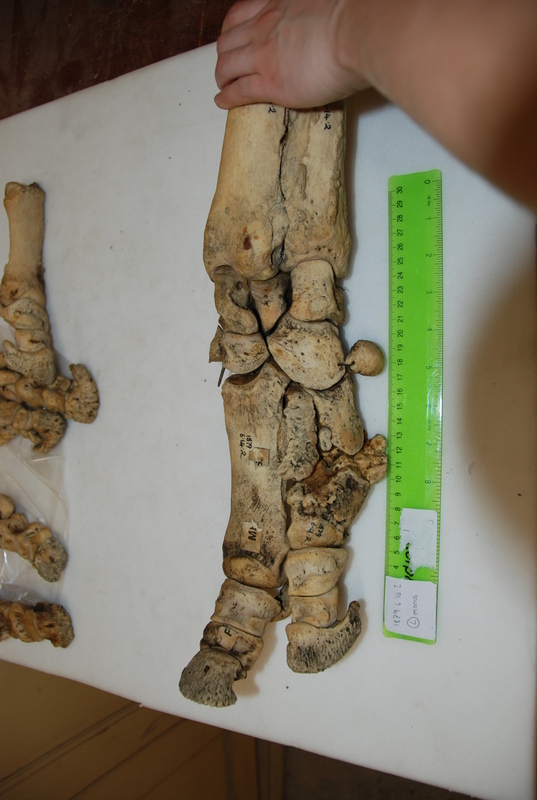 Unlike diseases which are fairly easy to spot (like abscesses or splitting of the nails and footpad), there is hardly anything out there in the scientific literature on bony diseases in rhino feet. It’s no small issue, either. When your feet each need to support over 900kg (typical for a large white rhino), even a relatively minor problem can be a major pain. Progressing unseen under their tough hide, lesions in the bone can eventually become so serious than the only solution is euthanasia, but even mild conditions can have negative consequences. For example, foot problems in other animals are known to have knock-on effects on fertility, which would be a big deal for programs trying to breed these species in captivity. Data gathering was a blast. I got to travel to Cambridge, Oxford, and London during one of England’s better summers, and these beautiful old museums were letting me snoop around their skeleton collections. 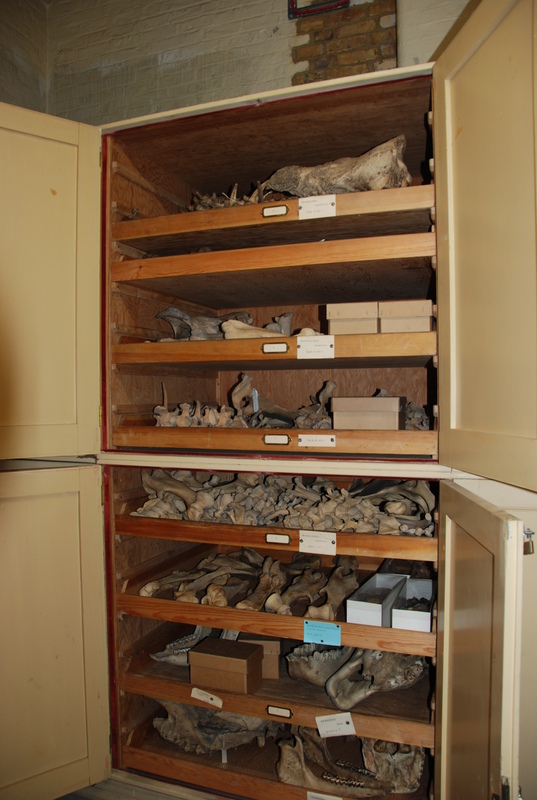 I’d been there often as a visitor, but it was anatomy-nerd-heaven to go behind the scenes at the Natural History Museum, and to be left alone with drawers and drawers of fantastic old bones. Some of the specimens hadn’t been touched for decades – at Cambridge University Museum of Zoology, we opened an old biscuit tin filled with the smallest rhinoceros foot bones, only to realise they were wrapped in perfectly preserved 1940’s wartime Britain newspaper. Osteomyelitis… (3 clickable pics above) the toe’s probably not meant to come off like that! In addition to my museum studies, I had another fun opportunity to do hands-on research. 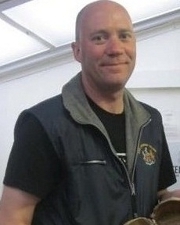 John (of course!) had freezers full of rhino legs (looking disconcertingly like doner kebabs, but maybe that’s just me! 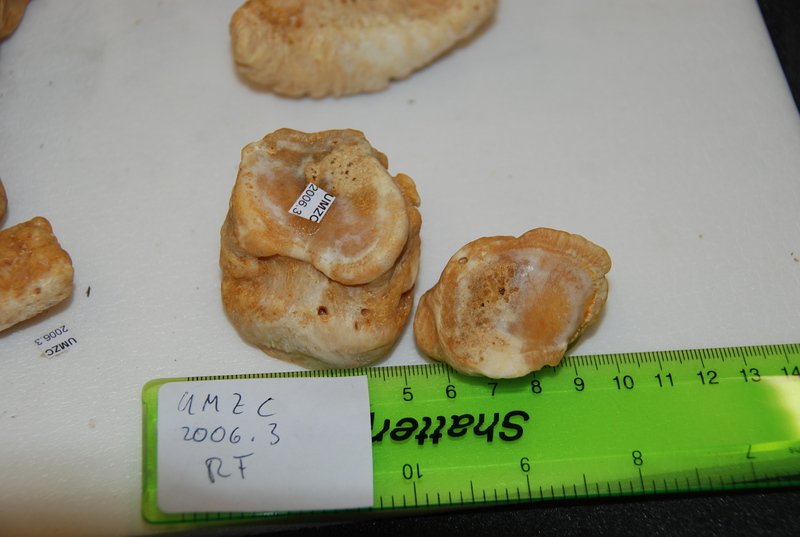 ), which we CT scanned to see the bones. Although it is a pretty standard imaging technique, at this point I had only just started my clinical studies at the vet hospital, and being able to flick through CT scans felt super badass. Most vet students just get to see some horse feet or dog/cat scans, at best. Another osteomyelitis fracture, visible in a CT scan reconstruction. We expected to find diseases like osteoarthritis (a degenerative joint disease) and osteomyelitis (bone infection and inflammation). 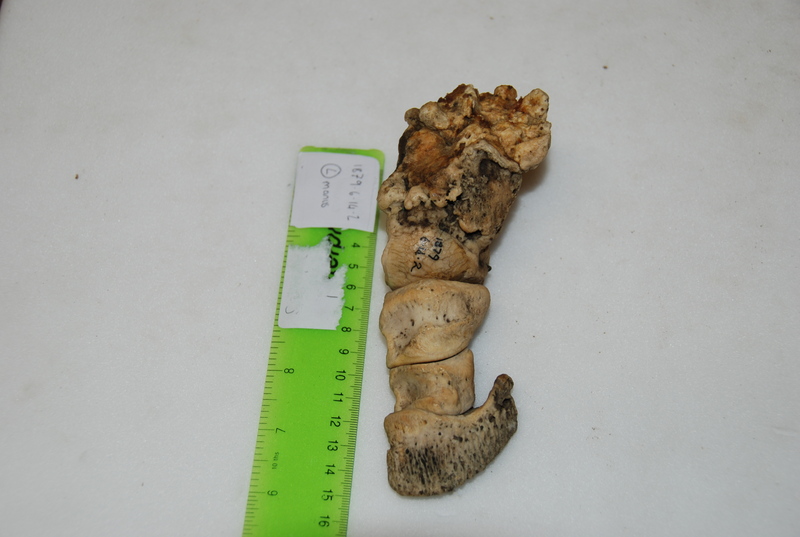 Both had previously been reported in rhinoceroses, although it was interesting that we saw three cases of osteomyelitis in only 27 rhinos, perhaps making it a fairly common complication. It’s an ugly-looking disease, and in two of the cases led to the fat, fluffy bones fracturing apart. We also had several unexpected findings, like flakes of fractured bone, mild dislocations, tons of enthesiophytes (bone depositions at tendon/ligament attachments) and lots of holes in the bones (usually small, occasionally massive). For me, writing up some of these findings was cool and freaky paranoid in equal measures. They hadn’t been much described before, and we were unsure of their significance. Was it normal, or pathological? Were we interpreting it correctly? Discussions with John and Renate (often involving cake) were reassuring, as was the realisation that in science (unlike vet school at the time, where every question seemed to have a concrete answer) you can never be 100% sure of things. Our study has a few important limitations, but has addressed a gap in the field and found some neat new things. Six months into my PhD, I’m enjoying research more than ever, and hoping that this paper will be the first of many (though I promise I won’t keep nicking John’s blog for my own shameless self-promotion if that happens! EDIT BY JOHN: Please do!). Nasty osteoarthritis wearing away the bone at the joint surface. 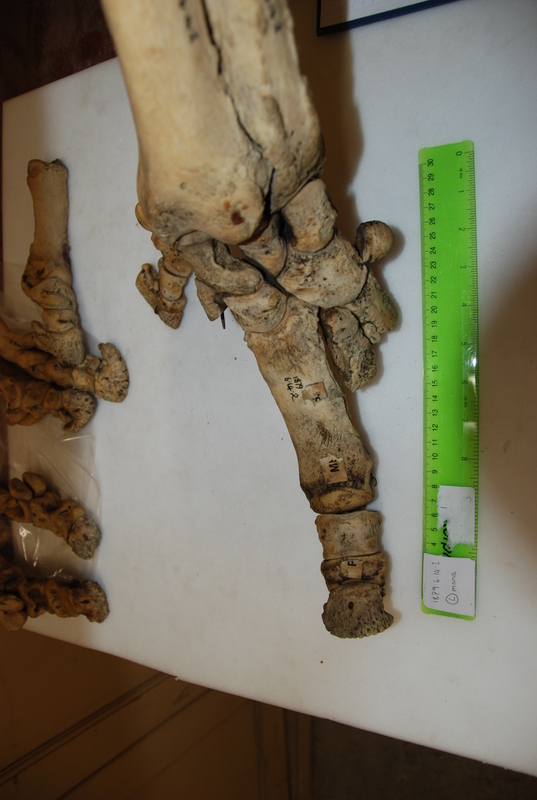 Most cases occurred in the most distal joint. Deep holes in some of the bones: infection, injury? 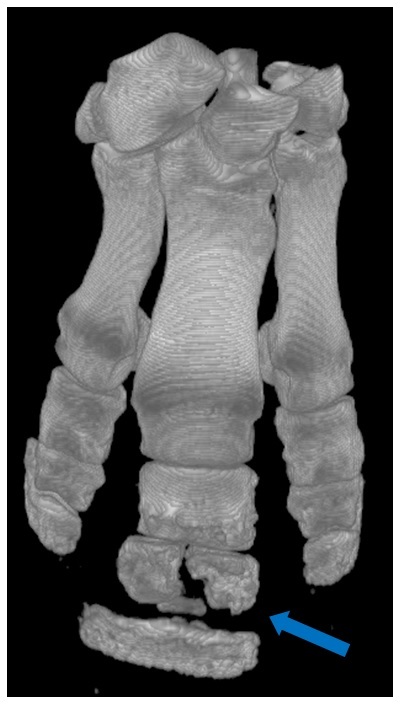 Sophie Regnault, Robert Hermes, Thomas Hildebrandt, John Hutchinson, and Renate Weller (2013) OSTEOPATHOLOGY IN THE FEET OF RHINOCEROSES: LESION TYPE AND DISTRIBUTION. Journal of Zoo and Wildlife Medicine: December 2013, Vol. 44, No. 4, pp. 918-927. As a total ignoramus in matters of direct interest to you, I can concentrate on the paradigm shift implicit in your research. Rather than going for the description of the idealized type (the skeleton in the upstairs glass cage) the research explores the fullness of individual diversity downstairs (the hundreds of discarded bones in the basements). Surprise: it is by sifting through the diversity than one stumbles on the “anomaly” that allows science to progress (Thomas Kuhn). (As always) dynamics is downstairs – the wisdom is in the crowd (of bones). For “practical reasons” (read implicit social convention going back to the House of Lords) exhibitions in museums are “elitist” and static: the result is one damn species after the other. You may wish to have an exemplary addition therein – e.g. the result of Sophie’s work – showing the import of “downstairs” and its underlying dynamics. It may get you the next generation of students. Ah, John, one minor thing: “folks” is, to my jaundiced ear, an import from the populist US. “You” is good enough. Content, not folksiness, will get you my undivided (albeit ignorant) attention. Thanks Aldo, I definitely would not use the phrase paradigm shift to refer to our work. Pathology has been studied in animals for centuries, as has individual variation. It’s just that we don’t know much about it in most species, in detail. So the concept is by far an old one, but the data on rhinos are nice and new. But yes, there is a lot of essentialism/typology in how people view animals, as if there is one ideal “normal” form and trivial variation about that. Even some scientists fall into this trap, but not many good scientists do. I’m also an import from the populist US so the folksiness is here to stay- you can take the Hutchinson out of Wisconsin but you can’t take the Wisconsin out of Hutchinson.